There is a reason why no other nation voted against censuring Israel's crimes against humanity. It's because the evidence overwhelmingly shows that Israel's actions violate international law and human rights conventions. It is shameful that Canada used the rocket attacks as an excuse since the evidence is clear that, once again, Israel broke the truce by resuming military incursions into Gaza. Even their pitiful excuse that Hamas was engaged in smuggling arms into Gaza ignores the fact that Gaza has a legal and moral right to defend itself - the need for which Israel is currently proving - and the smuggling would not have been necessary if Israel hadn't been maintaining an illegal blockade. 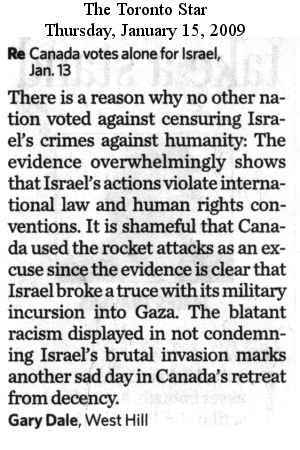 The blatant racism displayed by Canada in not condemning Israel's brutal invasion marks another sad day in Canada's retreat from decency. By our defacto endorsement of Israel's actions, we are now complicit in their ethnic cleansing of Gaza.